Dr. Clarice Modeste is a Grenadian politician and current Cabinet Minister. Clarice Modeste received her secondary school education at the St. Rose Secondary School. Upon Graduation she entered the teaching profession when she became the Science Teacher at the Waltham Junior Secondary School during the period 1972 to 1979. While she was a teacher, she also attended the St. Lucia Teachers Technical Training College. In 1980 Clarice left the teaching profession to attend the University of Havana Medical School. This period marked her development of her personal field of expertise, which would guide her achievements in future years. In 1987, modeste began her internship at the General Hospital and in 1989 she moved on to the position of House Officer. In 1996 she re-entered the teaching profession when she tutored Clinical Skills/Behavioural Sciences at the St. George’s University School of Medicine. She became the Registrar Ophthalmology in 1997. In 1998, as result of her long commitment and enthusiasm for health sector transformation in Grenada, she was appointed a member of the Senate of Grenada and immediately became Junior Minister of Health. She continued with her health transformation journey as she became part of the decision making process. In 1999, she was successful as the New National Party (NNP) parliamentary representative for the Parish of St. Mark. She became Minister of Health and The Environment where she excelled and became further admirable by the people of Grenada. Some of her well known accomplishments included, constructed the new Grenada General Hospital; implementation of the HIV/AIDS world Bank project; establish and implementation of the St. George's University and Government of Grenada Cardiology Program increased access to rural health services and creation of additional resources. In 2003, she and became the Minister of Communication and Works and continued her relentless nation building. As the records indicate, she effectively responded to the challenges of Hurricane: and Emily that devastated the nation. Working closely with former Prime Minister Dr. Mitchell, other Cabinet colleagues and international donors, Grenada made a remarkable recovery that saw the t restoration of the nation's infrastructure. She oversaw construction of bridges and roads; rural facilities; police stations; schools and child development centres. Between 2007-2008, she held the Ministry of Tourism portfolio and continued her diligent work where major extension of some of our tourism facilities such as the world renowned Fort Louis Marina; new cruise ship port on the Esplanade; the Bus terminal on Melville Street and the Bruce Street Mall. Apart from her distinguished service as a Minister of the Crown, she has also found time to remain engaged in civil society and philanthropic initiatives which include some of the following; Secretary, Vice President, The Grenada Medical Association; Member, Prevention of Blindness Com and the Foundation for the prevention of Blindness; Rotational President, Fan American Health Organization (FAHO) Assembly; First Deputy Chairperson, Executive Board, World Health Organizataion. Served for two consecutive years; Collaborated with Dr. Ida Hastick to publish a learning document the importance of culture in HIV/AIDS participated in a study with Dr. Peter Bourne to assess the of implementing a visiting Cardiology program in Grenada: Researched and published educational pamphlets on prevention of blindness, diabetic retinopathy and Glaucoma; Recipient of the Caribbean Council for the Blind (CCB) award for outstanding services to the people of Grenada, Carriacou and Petite Martinique in the prevention of blindness. Following the NNP's election victory In February 2013, Modeste was appointed Minister of Health in the Keith Mitchell Administration. 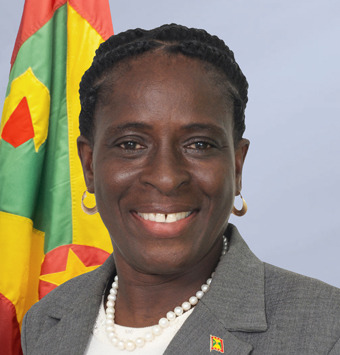 In November 2014, Modeste became Grenada's first female Minister of Foreign Affairs. In the 1 July 2016 Cabinet reshuffle, Modeste was appointed Minister for Tourism, Civil Aviation, Culture and Cooperatives, with specific responsibility for Tourism and Civil Aviation. Modeste is defending her St. Mark seat for the New National Party (NNP) in the 2018 General Election.